Leslie M. Ficcaglia, a member of the American Society of Portrait Artists, has been an artist for as long as she can recall. As a child she carried a sketchbook with her and took every opportunity to draw the people and objects she encountered. Largely self-taught, she attended life classes at The Art Students’ League while a student at New York University and more recently studied landscape painting with Glenn Rudderow, of the Pennsylvania Academy of Fine Arts, to learn oil techniques. This experience with landscapes is evident in the backgrounds she uses for her oil portraits. While she is proficient with more formal studies as well, her specialty is “Portraits in a Natural Setting” and she often depicts her subjects out-of-doors, in settings which are meaningful to them. Painting in her studio overlooking the Wild and Scenic Manumuskin River in rural Port Elizabeth, in southern New Jersey, Ficcaglia normally works from her own photographs. She finds that using photos as her reference material enables her to achieve fresher and more spontaneous facial expressions than would be possible if her subjects were asked to pose for long periods of time, and the warmth and sense of personality she is able to convey have become a trade- mark of her work. Ficcaglia’s choice of subject matter reflects both her background in psychology and her strong interest in the environment. Although she has only been doing figurative paintings since 1995 she has already developed a wide reputation for her work. 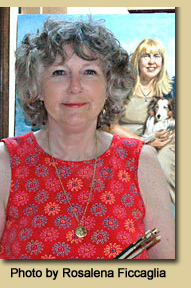 Her portraits in oils have been featured in articles and photographs in local papers, the Press of Atlantic City, and the Philadelphia Inquirer, and have been the subject of a radio interview, and her commissioned works hang in public and private settings in New Jersey, New York, Pennsylvania, Maryland, Florida, Nevada, California and the south of France. Several years ago she was honored to be commissioned by the New Jersey Conference of Mayors to paint a portrait of Governor James McGreevey and his wife, Dina Matos McGreevey, and she now completes the annual Mayor of the Year portrait for that organization. Recently Ficcaglia has made several trips to France, where she spends time with friends who live there and also explores the countryside. This has provided her with material for a series of mostly figurative paintings based on the people and places she has seen in the Southwest and in Paris. Ficcaglia has long been interested in ecotourism as a means of protecting her area’s resources. Her ecotourism brochure was distributed by her township and became the core for her first web site about the Wild and Scenic Maurice River. She served as a member of the Maurice River Township Planning Board for almost twenty years and as its chair for the last seven years of her tenure; she was also vice-chair of the Cumberland County Planning Board until 2007. She was active in the effort to obtain federal Wild and Scenic status for the Maurice River and its tributaries, working on the task force established for that purpose. In addition, for eighteen years she was the Pinelands Commissioner for Cumberland County and is a past trustee for the Association of New Jersey Environmental Commissions. She also sits on the county Tourism Council; has chaired the Maurice River Township Environmental Committee; acts as trustee for Citizens United, a local watershed organization; and is a member of the Delaware Bayshores Advisory Council of The Nature Conservancy. Ficcaglia received the 2003 federal Environmental Protection Agency's Region 2 Environmental Quality Award for Individuals for contributions to the protection of natural resources in the Southern New Jersey Delaware Bayshore Region and Pinelands Preserve. As a player in the City of Millville’s downtown revitalization project Ficcaglia was the founding chair for the board of the Riverfront Renaissance Center for the Arts, a gallery and community facility which serves as the cornerstone of the City's Arts District. She has a bachelor’s degree from NYU and a master’s degree in psychology from Western Washington University in Bellingham, Washington. Her biography is listed in Who’s Who in America.